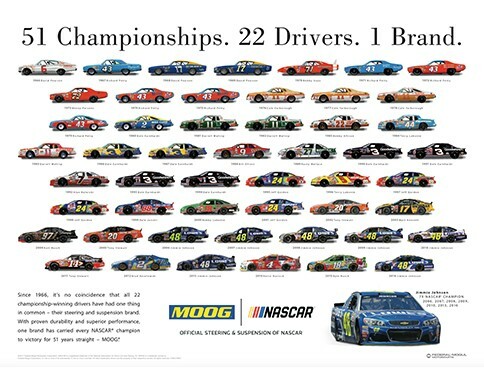 MOOG is proud of its partnership with NASCAR which began in 1966. The MOOG brand is the preferred choice of professional technicians and NASCAR crew chiefs, and every Cup champion since 1966 has driven to victory with MOOG steering and suspension parts. MOOG product engineers go the extra mile to develop innovative steering and suspension parts – including ball joints, tie rod ends, control arms, sway bar links, wheel hub assemblies, and more – that provide superior performance and durability and facilitate faster, easier installation. With proven durability and superior performance, one brand has carried every NASCAR® champion to victory for over 50 years straight – MOOG. Celebrate our 51st NASCAR® Championship and get ready for the 2017 Season with a printable version of our new poster!